Desktop publishing is a powerful tool. You can use a word processor and a printer to make your own little chapbook or pocket-sized book at home. A chapbook is a small book or booklet that is often used for poetry or short stories. Chapbooks were the first types of books published in early Europe. 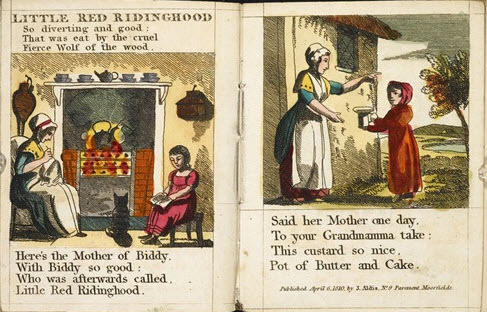 The image below shows an example from a 1810 chapbook edition of Little Red Riding Hood. The British Library has more information about early chapbooks here. Another good resource on chapbook history can be found here on the Antique Book Collecting blog, which says the early chapbooks "were extremely important for the dissemination of popular literature among the lower classes, for whom traditional books were prohibitively expensive." The Wikipedia entry for chapbooks notes that early chapbooks were published on a single sheet and then "folded into books of 8, 12, 16 or 24 pages." They are still published in this size today by small publishers. The Poetry Society of America maintains a list of chapbook publishers here. You can also publish them yourself. An article in The Guardian says it is time to rediscover the glory of chapbooks. Lee Rourke writes, "The booklets have been spreading the literary word for more than 450 years and they still have the power to delight and inform in equal measure." Chapbooks vary in size. There are no fixed size requirements but they are usually smaller than standard paper size, which is 8.5 by 11 inches. If you fold a standard sheet of paper in half it will measure 3.667 x 8.5 inches. The folding guidelines page from TechnaPrint describes a bunch of different folds and the resulting sizes. The advantage of doing it yourself with DIY chapbook publishing is you have total control over your little chapbook. You bypass the self-publishing services route. You can print as many as you want and give them away or sell them for whatever price you want. You can make your own chapbook at home using desktop publishing software (including Microsoft Word), a printer, heavy card stock paper (for the cover) and a few other tools. You can also do the layout for your chapbook at home and then take it to the printers. Here are some good resources for creating your DIY chapbook. How to Make a Pocket-Size Book in Word - Poets & Writers has an article with a slideshow that shows you how to make a small book at home using Microsoft Word and your printer. The step-by-step guide walks you through the page numbering, printing, folding and cutting. PW's article also includes a helpful video. Shadow Poetry: How to Make a Chapbook - This article from Shadow Poetry gives you advice about how to plan your chapbook, make a primary dummy book, get print shop estimates and more. How to Make a Simple Chapbook - FeltMagnet provides an illustrated step-by-step guide to making your own chapbook. DIY: 8-Panel Chapbooks - This visual aide offers a step-by-step guide to publishing 8-panel chapbooks. It shows you the cutting and folding process with photographs. DIY Five-Step Chapbooks - This resource from Natalie Thompson includes instructions for making chapbooks that includes downloadable templates. DIY Kettle Stitch Bookbinding Tutorial - This video from Sea Lemon shows you how to stitch together a larger-sized book. This tutorial from Lynda.com shows you how print a booklet using Microsoft Word. It includes steps for two side printing and how to view your document as a booklet in Word. Here's a video that shows you how to stitch together pages of a chapbook.